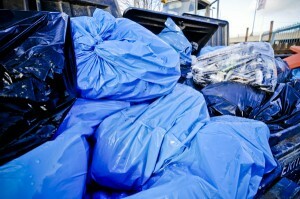 Looking for fast and reliable commercial waste removal in Islington N1? Away With It has been providing commercial waste removal Islington businesses trust since 2002. They love our flexible, reliable service and low prices and we’re confident you will too! We offer quick and efficient service to cater for all your business waste needs. Whether you need a regular kerbside collection or a same day wait and load on-demand service we can supply the perfect solution at a competitive price. Just tell us what you need and we’ll put together a tailored package for you. Our smart uniformed teams will arrive on time, load and dispose of all your unwanted waste and even make sure your premises is swept and left clean and tidy. We work with all kinds of business from estate and letting agents to offices, restaurants, nightclubs, bars, coffee shops, cafes and retail outlets. And we remove all types of business waste such as restaurant waste, bottles, bag collections, cardboard, unwanted furniture and much more. We are fully licensed waste carriers and carry full insurance. Plus 80% of the waste we collect is recycled or reused. To speak to a member of the Away With It team about your requirements for commercial waste removal Islington just give us a call on 0208 504 7390. They will be more than happy to recommend the most cost effective solution for your needs and provide a free, no obligation quote. Or you can get a quote using our handy online enquiry form. Just fill in your details and we’ll get back to you the same day.